Having my horses insured with Petplan Equine gives me peace of mind, knowing that I have their support and expertise should the worst happen. I have experienced Petplan Equine’s care and compassion first hand when I lost my young endurance horse. With Petplan Equine’s support we were able to try all treatment options and as a result we are left with no ‘what ifs’, we did all we could for him. As a result I wouldn’t hesitate to recommend Petplan Equine. Laura Graham has been riding, training and competing within Endurance for over 20 years. She has a team of endurance horses competing from Novice up to FEI level. This year, she aims to achieve 3* status and qualify to represent Great Britain. Laura places huge emphasis on the wellbeing of her horses to ensure she is able to take care of and meet her horses’ physical and physiological needs at all times. Laura has 12 horses, 4 of which she competes. Farrah is a quirky, 14.1hh pocket rocket who lives on adrenaline and she competes at FEI** level. Pearl is a cob, who she competes at Advanced level and Indie is a Tobiano mare, currently competing at Novice level. Sox is a chestnut homebred Arab gelding, who Laura backed this year and is currently gaining confidence. Continue to gain experience with Farrah at FEI level. Have fun with Pearl nannying our youngsters during their first competitive season. 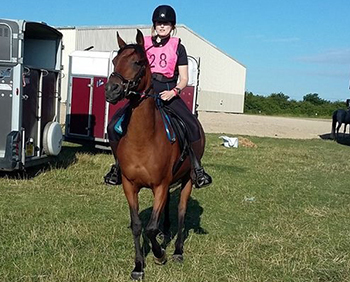 Gain Advanced qualification with Indie and attempt her first 80km FEI 1*. Obtain Novice qualification with Sox and Lark.